OESCO began importing LANCMAN water operated bladder presses from Slovenia several years ago when we realized that there was a need for an affordable small-scale commercial-quality press that was easy to use. From the beginning, our customers have been very enthusiastic about these presses! The principle is very simple: Using household water pressure, you expand a rubber bladder which presses outward against your prepared fruit, expressing the juice out through slots in a stainless steel container. There are no hydraulic pumps, no electical connections, no levers or wheels to apply mechanical force. The water does all the work. And it does it quite well. We have tested these presses side by side with one of our large hydraulic rack-and-cloth presses and we found that they yield about 90 percent of the juice of the rack and cloth press at a fraction of the cost. 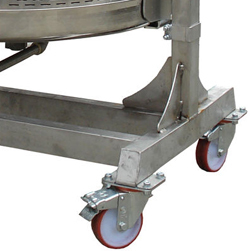 LANCMAN presses are easy to move around, too! And you'll find that they are easy to clean up. Once you have drained the bladder, you remove the top and rotate the press into a horizontal position. 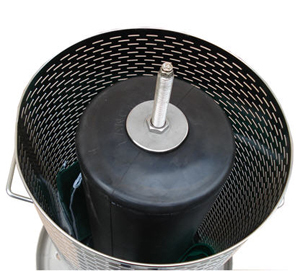 You then grab the top of the filter sleeve and pull. 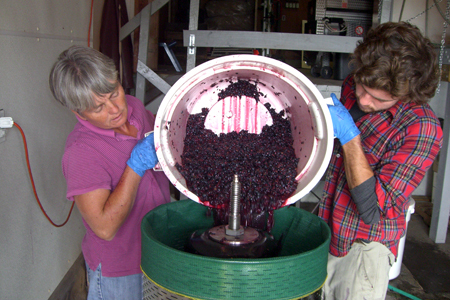 Generally, the fruit pulp comes out in a large lump. At this point, you rotate the press back to the vertical, reinsert the filter sleeve and you are once again ready to press. At the end of the day, empty your last pressing, rotate the basket into the vertical position, remove the basket with a quarter turn and spray everything down. Finally, maintenance on these LANCMAN presses is minimal. The rubber bladder will need to be replaced about every five years and it is assumed that you will replace hose gaskets and fittings occasionally as they wear, but other than that, you will need to do very little to the press. Take precautions against freezing and your LANCMAN press should last many seasons. call us and we will be happy to discuss what it is you are trying to do and to give you any guidance that we can! 5. 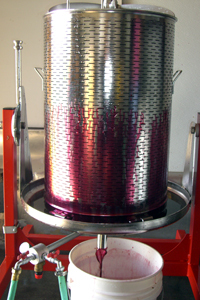 Fold the press liner inward – covering the fruit – and place cover back on top of the press. 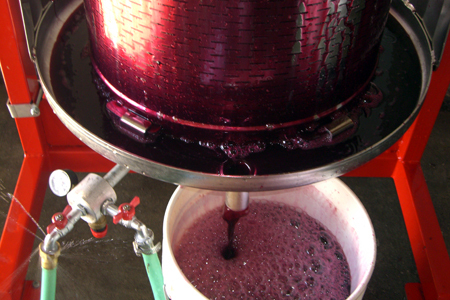 Juice will begin flowing as soon as you start filling the press. Have a container or transfer pump ready for use to collect juice. 5. Begin to open inlet valve slightly to start the pressing. 6. During the pressing process monitor the pressure gauge. The pressure should barely rise during the first 20 minutes. By slightly opening and closing the inlet valve you can control the pressure. Press slowly!!! 7. The safety valve will open & drain off water during pressing if the pressure exceeds 2.5 – 3 BAR. (this is normal). Water will continue to drain until the pressure drops back into range. 8. When the juice has completely finished flowing and the pressure gauge reaches 36-40 PSI, close the inlet valve and open the drain valve to empty the bladder. (on bottom of press). 9. 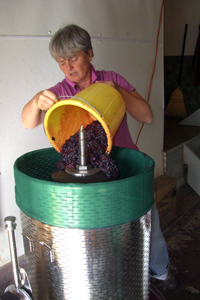 After pressing is complete, pull the release knob up and tilt the basket 90ᵒ to remove pressed fruit. Also use when cleaning press. 10. Clean press and cover. Store with all inlet & outlet valves fully open. (this is especially important for winter storage).